Mission Accomplished! (Or maybe not…) – Part II - Professional Association Management Company | Virtual Inc.
Spec Maintenance: As folks start implementing the standard, they’ll find problems in it. This is natural – not a signal that your standard is flawed or poorly written. Implementation will also spur new ideas for features to be added in future revisions. That is, all standards have a life cycle – version 1.0 is just the start – and associations need to be prepared to support this life cycle. Also consider how your organization will collect comments and proposed changes to the document. Using email and spreadsheets might work initially, but those methods usually falter badly under heavier volume. A flexible database or issue tracking tool is strongly advised. Training and Education: Technical specifications and standards often take years to develop. Those participants involved in the process from start to finish tend to have a very strong knowledge of the specification and how it should be implemented. But for those parties which plan to implement the spec but were not part of the working group that created it – or at least not for its entirety – some context around parts (or all) of the specification may be missing. Associations can minimize those gaps in knowledge or context by having their technical leads develop informative implementation guides or perhaps lead webinars to help educate implementers as they start to build products. Retune Your Membership: OK, so this is not exactly a technical item – but in a way it really is. 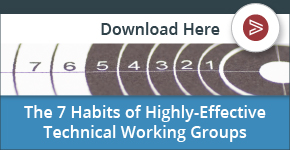 As I noted in my last post, member-company resourcing within a technical working group often shifts dramatically once a major milestone (such as a spec release) is achieved. To ensure these working groups are resourced adequately as they embark on their important post-publication activities, associations may consider recalibrating their membership structures to allow different types and tiers of members to participate in the group or take on leadership roles within. Doing this can result in a new surge of energetic volunteers, a new approach to solving technical issues and even a new corps of technical leaders. As the saying goes, change can be hard. But not planning for change at a critical juncture of an association could be a real setback for any group.